From the first million-dollar medical malpractice verdict in California (1970) to a $1.9 billion settlement for California consumers to a $25,000 verdict for a homeless man bitten by a dog, every case Girardi | Keese handles receives the care and resources that come from our collective experience. At Girardi | Keese, our lawyers and staff are here for the long haul because we are doing work we believe in. Tom Girardi has had two secretaries since 1965. Bob Keese has had one. The firm has had only two bookkeepers in our history. To put our dedication and many years of experience to work for you, contact us by calling (800) 401-4530 or by sending us an email. We have a passion for righting wrongs and serving our clients. Speaking for wronged people: When people are injured or killed because of someone else's actions, they deserve fair compensation. Our personal injury attorneys are willing and able to go up against huge companies to speak for individuals who have been harmed. Developing winning cases: Tough, complex cases require significant resources, including expert witnesses; engineering, medical and scientific knowledge; and dedicated attorney and financial resources. Our attorneys discuss cases as a group, drawing ideas and creative approaches from collaboration. Our trial experience is exceptional — 11 attorneys are members of ABOTA (American Board of Trial Advocates). Working with lawyer referrals: Most of our cases come from lawyer referrals, because lawyers want the best representation available for their clients. Referring attorneys become a part of our legal team for the duration of the case. Assuring our future: Our past has been filled with rewarding experience. 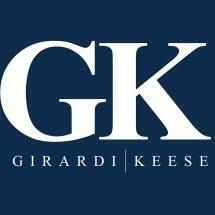 We work every day to assure that tomorrow's Girardi | Keese law firm will be even stronger and more successful. When we bring in promising new lawyers, we give them all the support they need to reach their full potential. Serving the community: We have been fortunate as a law firm. We share our financial rewards and professional experience with the community around us. Changing the law: It is not enough to sue individuals and businesses that have harmed others. Our law firm works in Sacramento and in Washington, D.C., to strengthen the laws that protect individuals. In all of our practice areas, from personal injury to business litigation, from intellectual property to product liability, Girardi | Keese lawyers have an extraordinary depth of experience. We work hard, but we enjoy every minute of it. We know that the work we do helps people move on with their lives even after terrible tragedies. And we know that we are making the world a better and safer place. Contact us to discuss your case. We represent clients throughout California and nationwide.